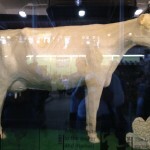 The Butter Cow - A Midwest State Fair Tradition & a Hollywood Movie? - JP loves LIFE! 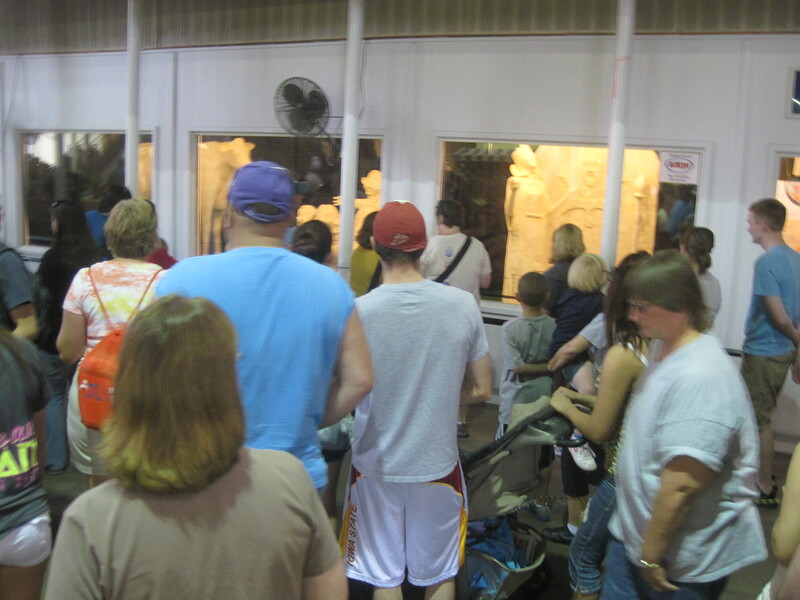 The Butter Cow – A Midwest State Fair Tradition & a Hollywood Movie? 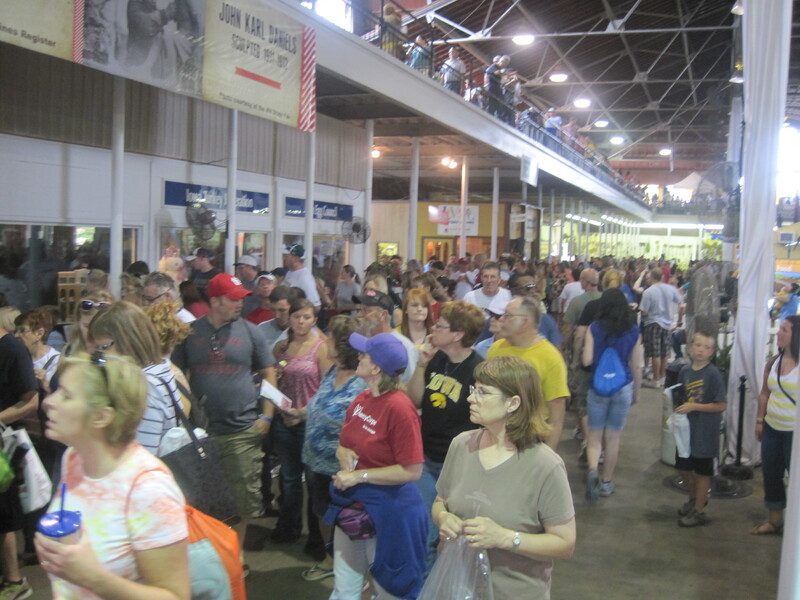 Last month, I wrote a post about my pending visit to the Iowa State Fair and this weekend I shared some of the sights and sounds of the fair, but the butter cow…. That is something that deserves a post of its on. 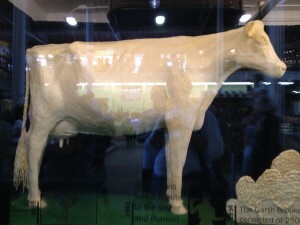 What is a butter cow? The Butter Cow starts with a wood, metal, wire and steel mesh frame and about 600 lbs. of low moisture, pure cream Iowa butter. 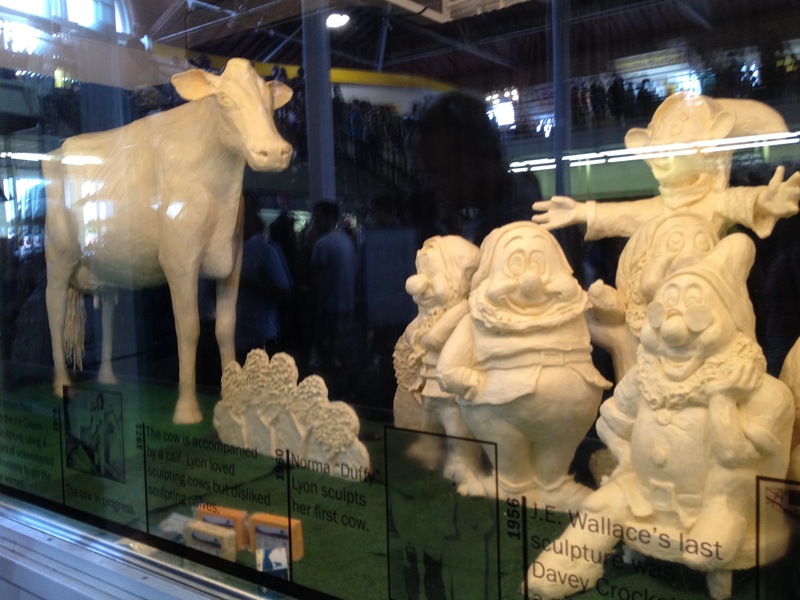 Once inside the 40-degree cooler, layers of butter are applied until a life-size butter cow emerges – measuring about 5-1/2-ft high and 8-ft long. While a real dairy cow weighs more than 1,000 pounds, a 600-lb. 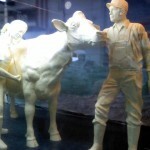 butter cow would butter 19,200 slices of toast and take an average person two lifetimes to consume. Much of the butter is recycled and reused for up to 10 years. 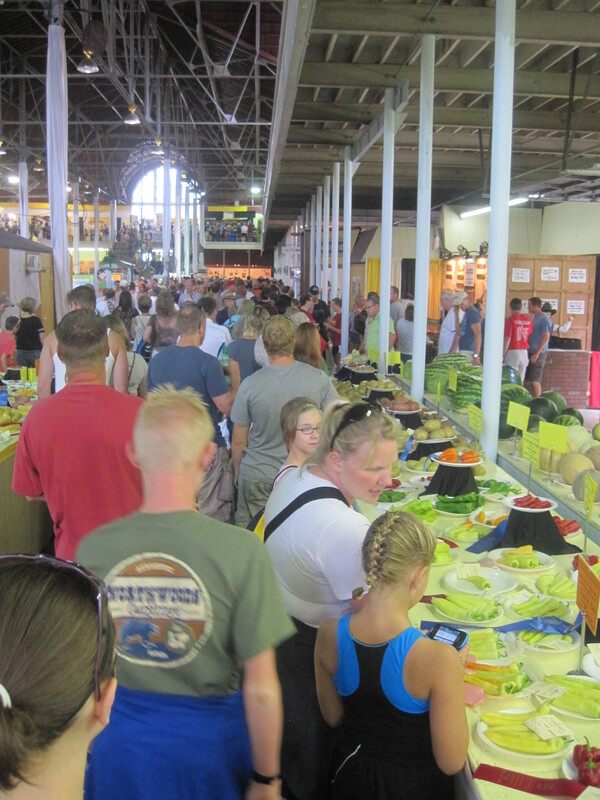 Several years ago, when I first heard about butter cows, it was through the enthusiasm of a friend — Mike Haley who later spurred the great butter-lard debate of 2010 about cookies — who couldn’t wait it see that year’s at the Ohio State Fair. I still remember asking him a million questions. 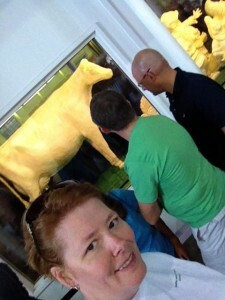 Eventually he sent me a photo of the butter cow and I seem to remember a football player sculpture too. 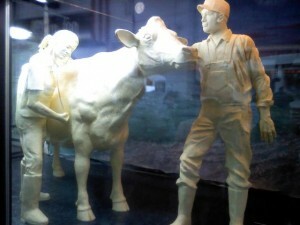 Thanks to Google, I can show you that sculpture from 2009 — it was the cow, farmer and a vet! 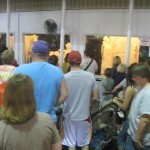 The line to see the butter cow was incredibly long! I waited for probably 30 minutes. 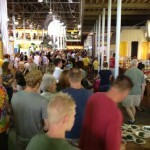 Hard to believe all of that just to see butter, but I wanted to take in the event fully. No skipping around the line to peer over other people. And once I got up to the first pane of the window, I stopped dead in my tracks to take it all in! It’s More than Just Cows! The sculptor doesn’t just do cows for the Iowa State Fair. In fact, there is a companion sculpture each year. This year I did everything in my power to stay unaware of what the companion piece was until I could see it with my own two eyes! And it was truly something! The line first came to the window pane where I saw the Evil Queen holding the poisoned apple. I took note of so many details as a carousel slowly turned, replacing the queen with Snow White. We inched along and watched as Snow White and the Seven Dwarfs came into view. You have to see it to believe it. 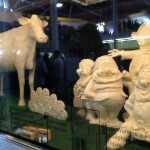 2011 Replica of 1911 butter cow sculptures, including a calf, young boy and chicken. A sculpture of a young girl with a butterfly was added as a tribute to Norma “Duffy” Lyon. 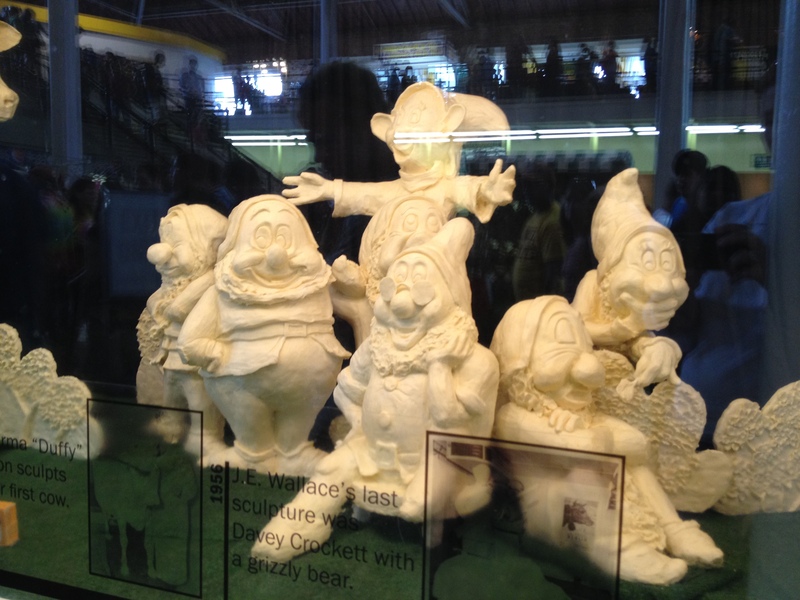 In 1911 J.K. Daniels sculpted the Fair’s first butter cow and was succeeded by J.E. Wallace of Florida. 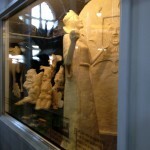 In 1957 Earl Frank Dutt of Illinois took over the sculpting duties. 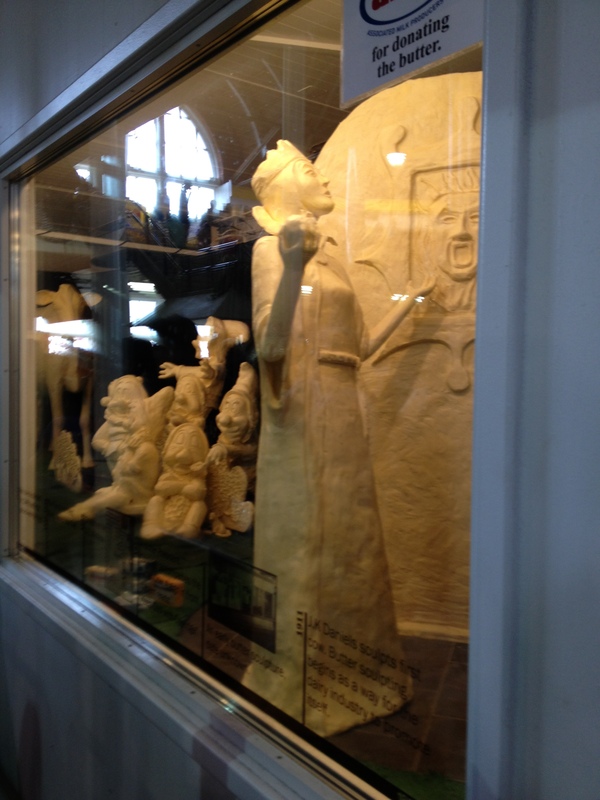 Norma “Duffy” Lyon of Toledo, Iowa, began sculpting in 1960, becoming the fourth person and first woman to sculpt the Fair’s butter beauties. Lyon passed away in June of 2011. 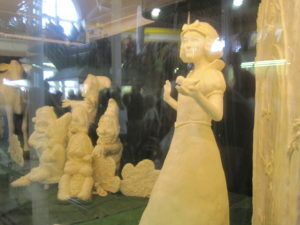 In 2006, after 15 years of being Duffy’s apprentice, Sarah Pratt of West Des Moines became the Fair’s fifth butter sculptor. In addition to her first Butter Cow, Pratt also crafted Superman of “Superman Returns” (Norwalk, Iowa, native Brandon Routh, who starred as the man of steel) and “Mr. State Fair” Bill Riley (in honor of his 60th Fair). 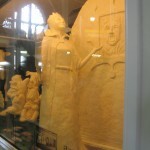 With something that has such a long, rich history, it is a little bit surprising to me that people still are mesmerized by hundreds of pounds of butter sculpted to look like a cow. But its cool that the sculpture relates to the very source of butter! The souvenir I bought at the show was actually connected to the butter cow in that it was a toiletry bag made from the a previous butter cow banner! 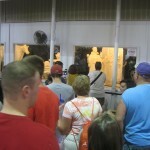 And this year, the Ohio State Fair had their butter cow take over Twitter! And Hollywood has produced a movie called “Butter” that will be in theaters in October and released on DVD & for download early next year. Just watching the trailer makes me want to watch it and I’ve given serious thought to downloading the rental version or checking to see if its available on demand! A tale of competition at its most cut-throat, BUTTER surveys the raw ambition of Laura Pickler (Jennifer Garner), the wife of Bob Pickler (Ty Burrell), Iowa’s long-reigning champion butter carver. For 15 years, Laura has relished her high-profile role as the beautiful, loyal helpmate to her affable, artistically gifted husband. But when Bob is pressured to retire and allow someone else a chance at glory, an indignant Laura decides to enter the competition herself. She is first in line on sign-up day, only to see her odds of victory fall below 100% with the arrival of an unlikely yet formidable contender: 10-year-old Destiny (Yara Shahidi), the African-American foster child of local couple Julie and Ethan (Alicia Silverstone and Rob Corddry). And that’s not all. Bob’s would-be mistress, bad-girl stripper Brooke (Olivia Wilde) also declares her candidacy, as does his #1 fan, Carol-Ann (Kristen Schaal). Facing three opponents, mocked by her stepdaughter Kaitlen (Ashley Greene) and furious with her husband, Laura resolves to do whatever it takes to win. And if that means resorting to sabotage – and recruiting her dim-witted former boyfriend Boyd (Hugh Jackman) as a co-conspirator – then so be it. « Can someone leaving me speechless serve as #WordlessWednesday? 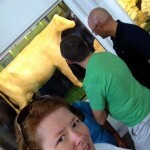 I love the Butter Cow! 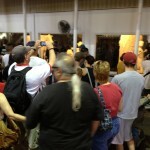 It always amazes me that a butter cow can drum up so much enthusiasm! It is hard to believe isn’t it! Totally fun part of Americana I’d never gotten to expereince! 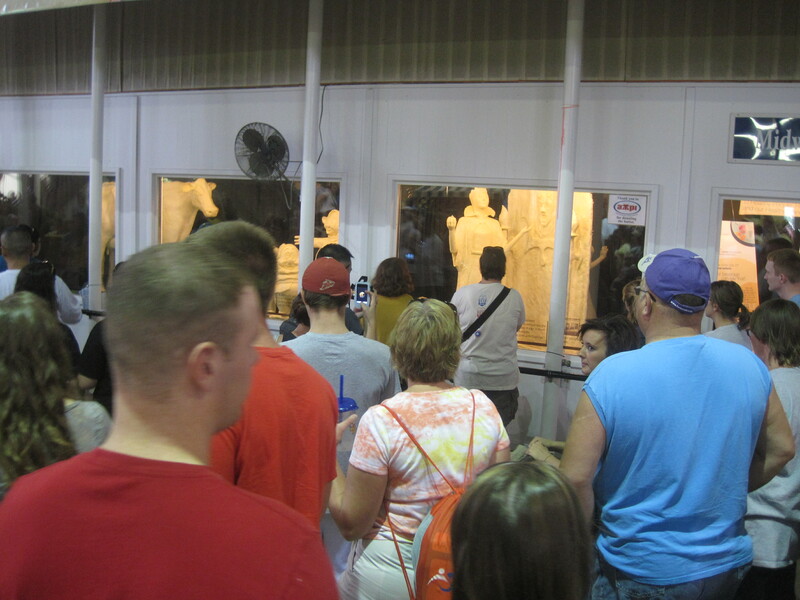 First of all, the butter cow is one of my favorite things to see at the Illinois State Fair! However, we must not be cool enough to have that second sculptor, because I have never seen a butter sculptor of Snow White. That is truly amazing!! LOL! I think Iowa pushes it a notch with the other sculptures… LOVE IT! 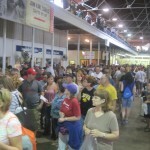 I’ve had lots of encouragement to visit the Illionois State Fair next year. 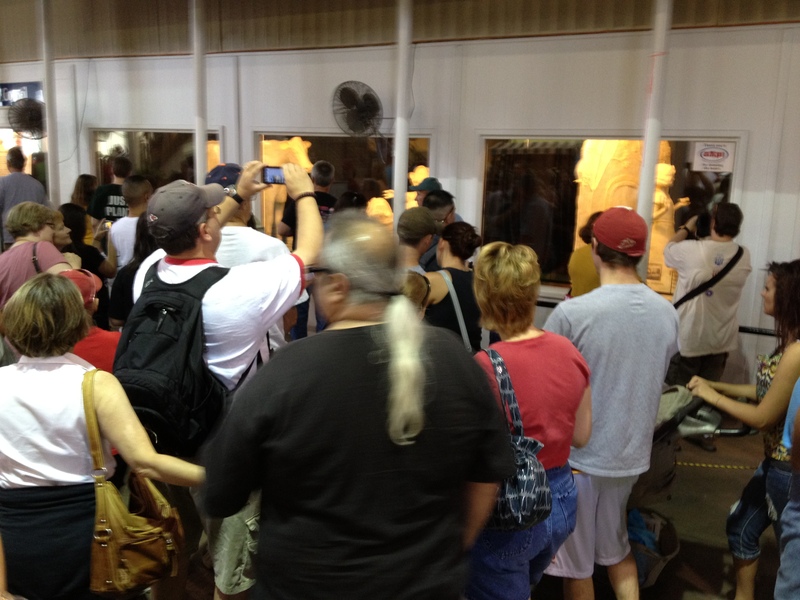 Janice, my offer still stands to have you come visit the Minnesota State Fair. 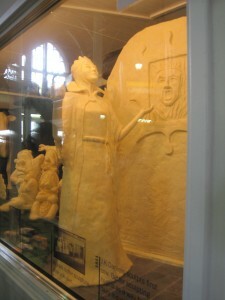 I loved the Iowa butter cow too, but the MN tradition is to have “Princess Kay of the Milky Way” (the reigning dairy princess) and the other finalists from the dairy princess competition to have a sculpture of each princess (a head and shoulders bust) carved from a 90-lb block of butter. Each finalist bundles up and sits for their 6-8 hour sculpture session. One princess each day has her likeness sculpted from that block of butter. You can go by and watch them being made each day at the fair which is strangely fascinating to watch! 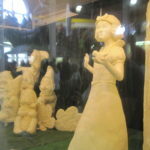 What I think is funny is each princess gets to take their butter bust home at the end of the fair, and stories abound of families holding massive sweet corn feeds to use up the butter! 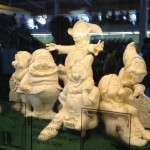 🙂 You have to love the quirky state fair traditions in the Midwest of sculpting from butter. That’s a wild tradition on top of butter carving! May just have to do it! Wow, those are amazing. 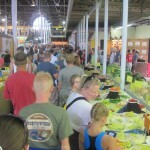 Of course, they do something similar at the State Fair here in Minnesota. If you ever come this way, I hope you’ll let me know! Of course! Am looking forward to meeting you! 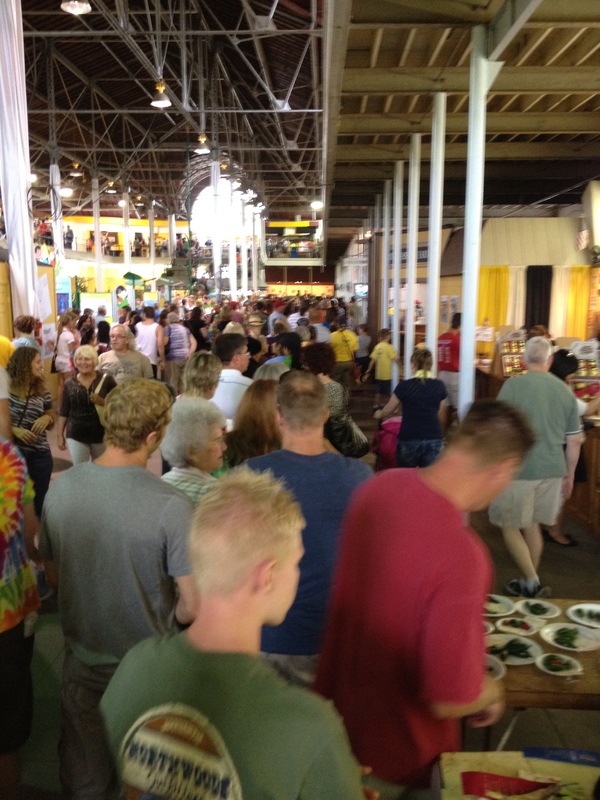 Wow I didn’t know other states, besides Ohio, had butter cows at their fairs. Cool, thanks for sharing. I didn’t know any states had them for decades! LOL! Glad you enjoyed the post.